Students are clamoring to sign up for James Dopman’s Law and Social Justice class, in part because of the extraordinary experiences beyond the classroom walls that are an integral part of the curriculum. 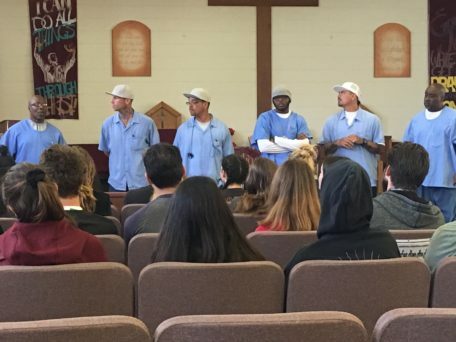 Last week, class took place for 60 Berkeley High School students inside San Quentin State Prison. Law and Social Justice students study the checks and balances built into the Constitution and legal foundations and are taught regularly by guest lecturers directly involved with the criminal justice system and social justice reform. As is the case with the visit to San Quentin, the ride alongs with the Berkeley Police Department, observation of courtroom proceedings in San Francisco, and lectures at Berkeley Law are all part of the field experiences at the center of deep learning for students built into the course. After three years of developing this class and building on its successes, Dopman will be teaching Law and Social Justice II for the first time in the coming school year. He’s designed an advanced level course for 12th graders that’s being added to complete the Career Technical Education Law and Social Justice pathway. identifying rehabilitation programs within prisons that create future opportunities and lower recidivism rates. Students hear inmates discuss their crimes and their paths towards accepting their actions and learning from those actions. 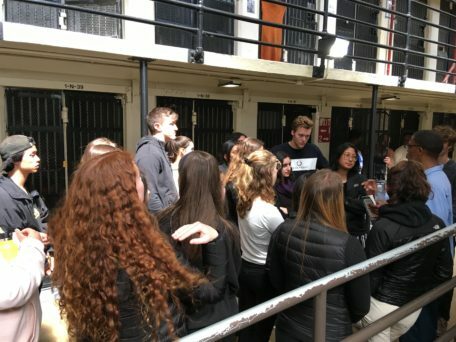 Students are shown inside the cell area to see the full extent of the facilities and living conditions.